When professionals switch to a home office setting, they often find their productivity increases drastically. The peace and quiet allows them to renew their drive to succeed in both short-term and long-term work projects. But as time wears on, clutter piles up. Stop getting distracted by a messy home office. Clean up your working space with these tips from Mr. Junk. Scrap paper. Even in the digital age, paper piles up. Most professionals have stacks of business documents, memos, and office junk mail. If you work at home, you can probably add home bills and personal letters to the list. Clean your home office by purging old and unnecessary documents. File the rest in a color-coded filing system and designate one spot (a folder or a box) for incoming mail. Make your supervisor proud. It’s hard to work when surrounded by junk. Refocus on the task at hand (and make finding supplies infinitely easier) by organizing office supplies. Designate a drawer for printer cartridges and stationary, keep a jar for pens and highlighters, and move any supplies that aren’t office related into another room. Conceal cables. Printers, computers, and other electronic office equipment come with more cables than you can count. It may seem like a small matter to leave cords tangled behind the printer, but if you take an hour to conceal all your cables, you’ll be amazed at how much cleaner the office looks. Invest in furniture. 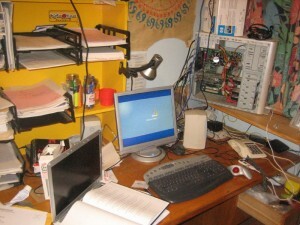 Many professionals view the home office as a temporary setting. As such, they’re not worried about creating a highly functioning working space. But pulling spare chairs from the dining room feels cluttered after a few weeks of working. Invest in basic office furniture like a desk, an ergonomic office chair, and a bookshelf. Ready to haul off office clutter? Call Mr. Junk to remove the evidence of your home office organization project.